Click the pictures to enlarge them and get a better look. All except one tomato plant gave up producing about 6 weeks sooner than usual. That means no tomatoes for me in December and/or January. The most beautiful and most productive tomato plant was the one in the fence border close to my back door. It’s still producing! And it’s why I’ll have tomatoes in November. The first picture was taken in September. (Note the sedum has turned pink.) Click to enlarge so you can see more of the fruit. The plant cascades to the ground, so there’s fruit there too. Tomato plant in fence border. Mid September. The second picture was taken Oct. 20th (Note the sedum has gone from pink to rust color.) As you can see, it’s still beautiful and heavy with fruit. 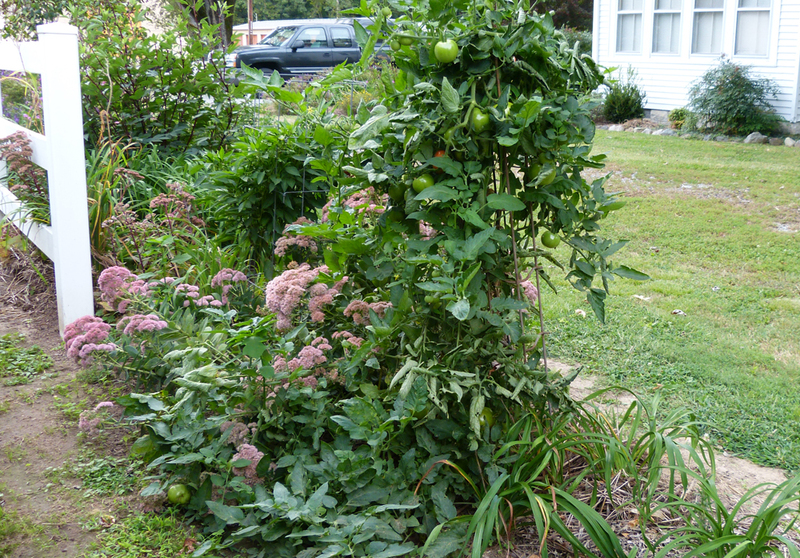 Tomato plant in fence border on October 20th. Harvested from the tomato plant in fence border one day in October. Peppers are a highlight of the fall garden. Always slow to get started in my garden, they’ll produce all the peppers a gardener could want once conditions suit them. They gave me a bit of a scare this year. At least a half dozen of the biggest and most beautiful plants only had one or two peppers on them all summer. 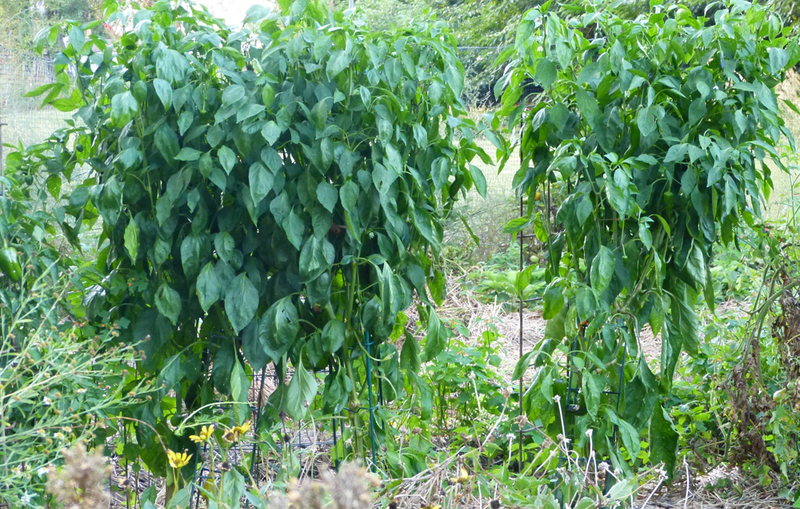 Pepper plants are beautiful in the fall garden. 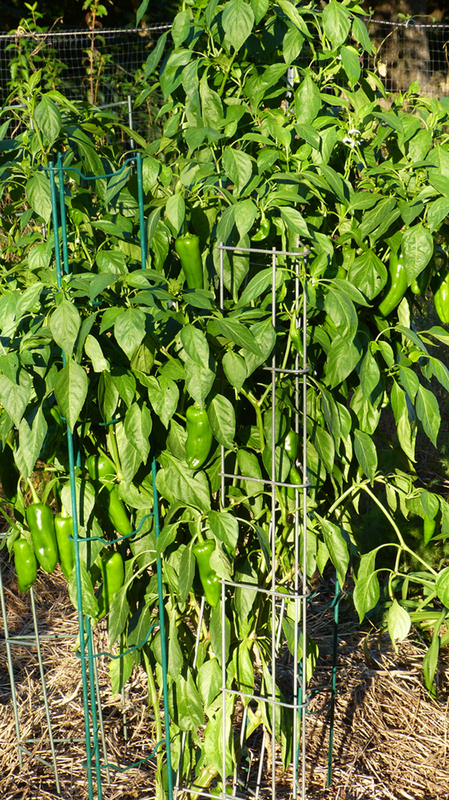 It was as if nature waved a magic wand on September 1 and suddenly the plants were covered with small peppers. By the end of September the fruit was so big and so heavy that I had to add more stakes so the branches wouldn’t break. 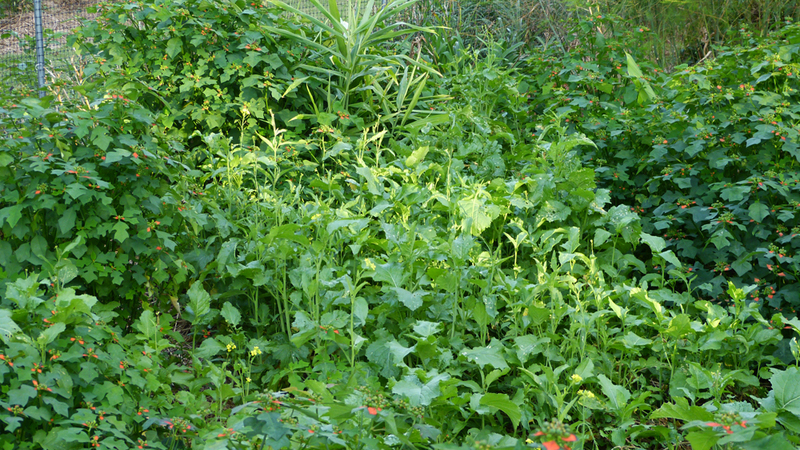 Most of these plants have 5 or 6 stakes for support. They could’ve used more if I’d had any. This picture was taken October 19th. Seven stakes support this pepper. My friend, Charles, who is a conventional gardener of 50 years recently visited me and wanted to see the garden. He was amazed at the peppers. As we stood beside the plant pictured above we counted more than 50 peppers and there were at least that many that we didn’t count! The pepper on the left is a Buran. It’s still a little green, but will turn totally red within another day or so. I’ve been eating 2 to 3 red peppers a day since about mid September. The big chunky pepper (pictured above) is a Buran. It’s a new variety for me this year. Have saved seed for next year from one of the biggest and best fully ripened ones. Buran doesn’t get as tall or produce as many as varieties like Marconi or Corno di Toro. But they’re prolific enough to make it well worth growing. Very meaty, large, and sweet especially once they turn red. 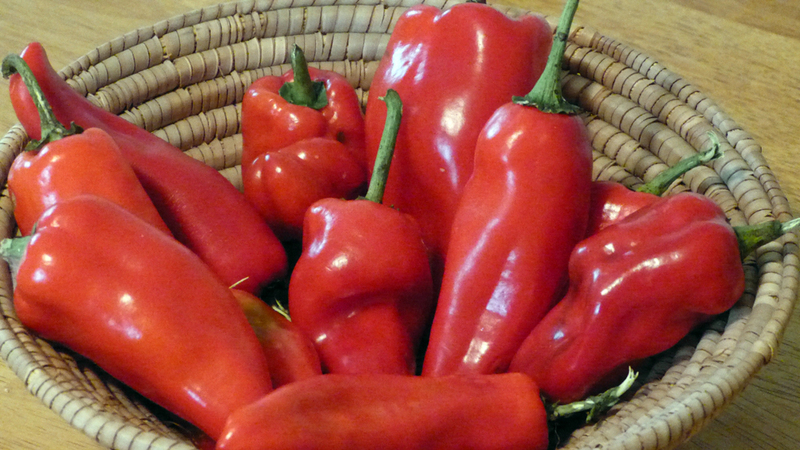 Bridge to Paris and Marconi peppers fully ripened. 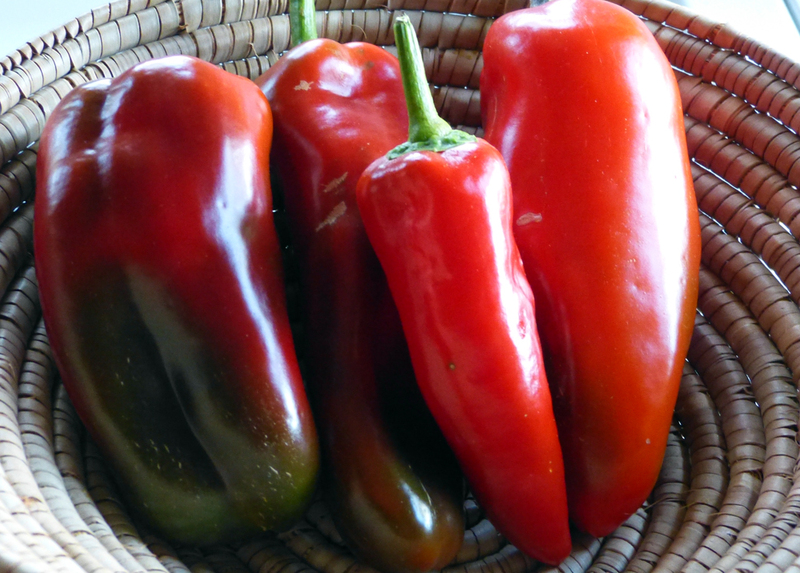 In case you’re new to gardening, all peppers turn red when they’re mature. When they do, they’ll be sweeter and they’ll have a lot more Vitamin C in them. Turmeric and ginger are two of the most beneficial herbs you can add to your diet. However, finding quality rhizomes can be difficult. What I’ve seen in stores never compares to fresh-just-harvest ginger or turmeric from healthy soil. 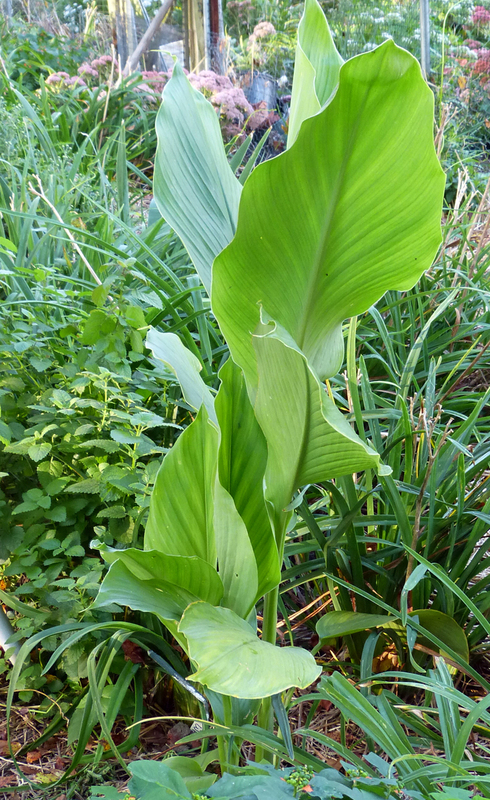 This Turmeric plant is a real eye catcher. Lush, green, and almost 4 feet tall. It seemed to me that the greatest growth was in September as the plants appeared to double in size. Ginger growing in one of my borders. Plants are about 2 1/2 feet tall. 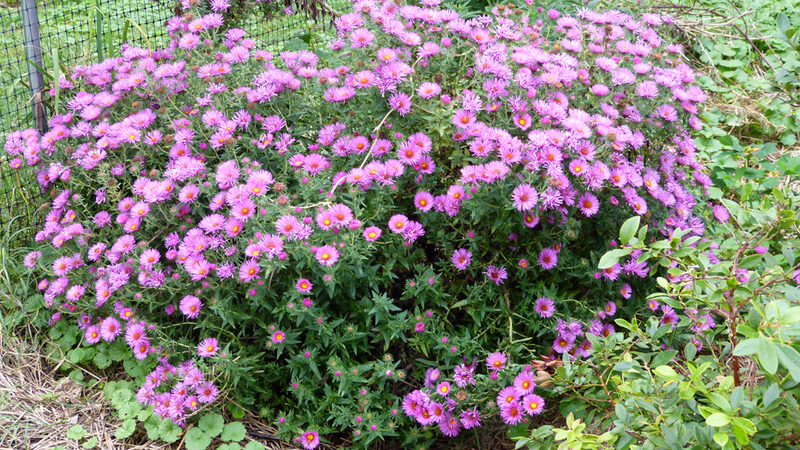 If you’ve ordered the hot pink aster from me in the past, below is the parent plant from which yours was taken. Aster novae-angliae is native to most areas of North America east of the Rocky Mountains except the far north. 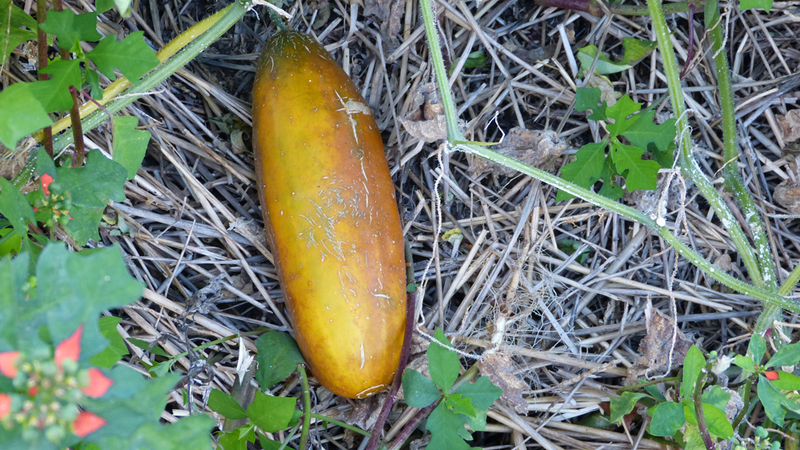 Saving this Marketmore cucumber for seed, I left it to mature until the vine was dead. I brought it inside a couple of days ago. Once it starts to soften, I’ll scoop out the seed. After fermenting for five days in a jar of water, the good seeds will sink to the bottom. I’ll take the scum off, rinse the seeds in a colander, and dry on a piece of screen for about 3 weeks. Cucumber seed stored properly (cool, dry, dark place) will remain viable for 8 to 10 years. You can’t get much better than that! A Marketmore Cucumber that I’m using to save seed. I had cucumbers well into October. 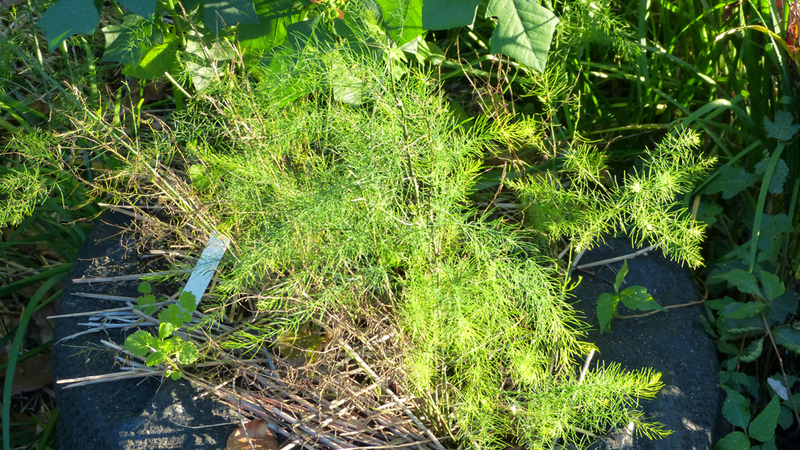 These asparagus were grown from seed and then transplanted to a grow bag for the season. Next spring I’ll lift the roots. select the biggest, and plant in a permanent location. And yes, that’s poison you see to the right that needs to be removed. I can never totally get the root out because it’s entwined in the fence. Thus, the poison comes back every year. One of many reasons to hate fences. A grow bag is a temporary home for these asparagus seedlings. 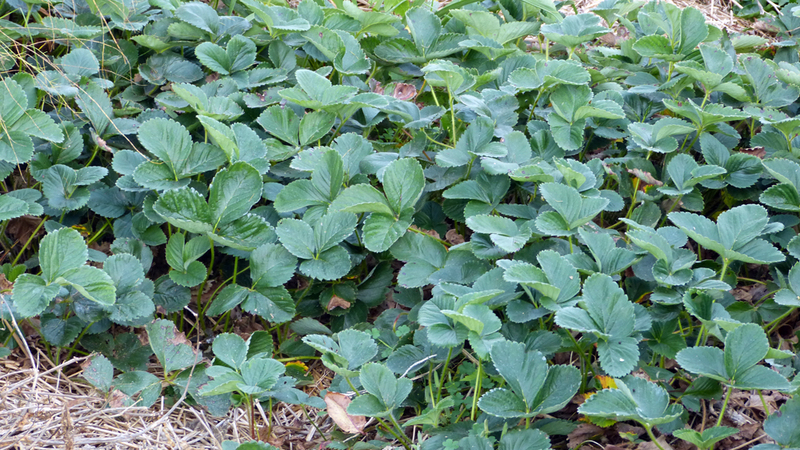 Most of my strawberry plants were lost last winter while making some major adjustments to beds. Had only enough to snack on this spring. They’ve made a comeback and look great this fall. Fall and winter are great for trapping because holes are readily visible. Traps are under the upside-down pots in the picture below. 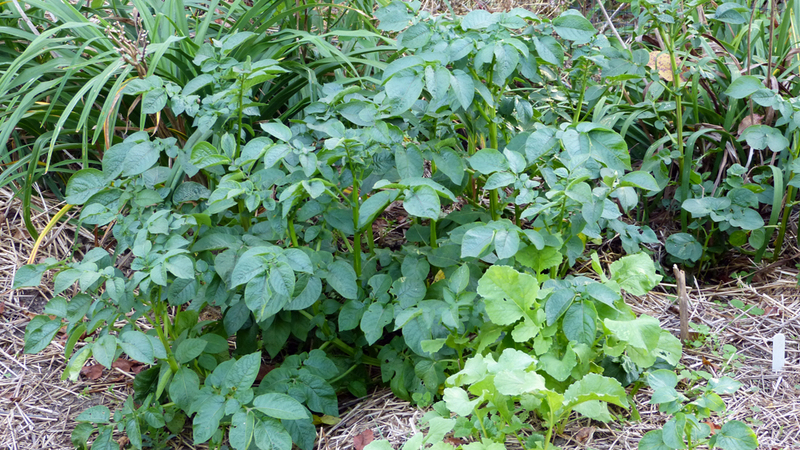 The patch of green in the top-middle of the picture is peas. They produced only enough to snack on. But – they’re still blooming and may have time to produce a few more pods. The green plant with red in the picture below is summer poinsettia. I use the annual, summer poinsettia, as a cover in various parts of the garden. Mustard is also shown here, which I seldom plant. Note the ginger plant at the top center. 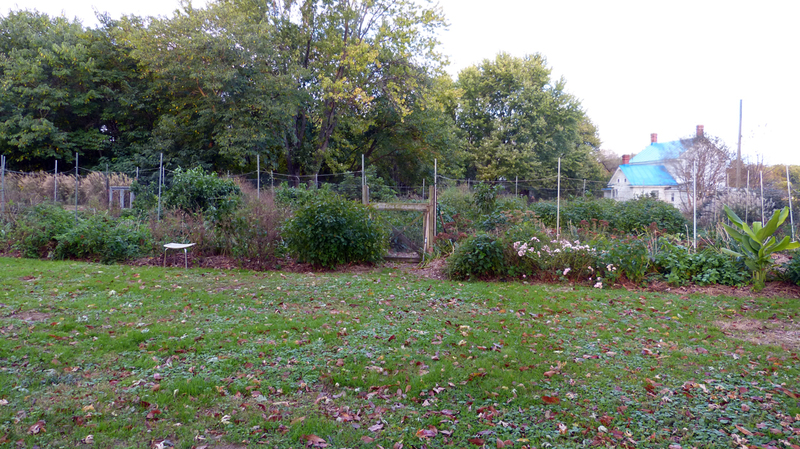 Looking at an angle across four garden beds. Summer poinsettia, mustard, ginger and some asparagus ferns at the top. The summer poinsettia, which sometimes reach my shoulder, is always covered with bees and other beneficial insects. A type of wasp on the summer poinsettia seed. I don’t know this blue fellow’s name, but isn’t his color magnificent? Anyone know what they’re called? When these guys visit, there are dozens of them. Friends harvested theirs more than a month ago. When I heard they’d harvested, I got so excited I dug two of mine. Big mistake. Mine had not finished growing, so I didn’t get as many from those as I would have had I waited. Every garden is different. Although my friends only live a mile away, their garden is on a different time schedule than mine. 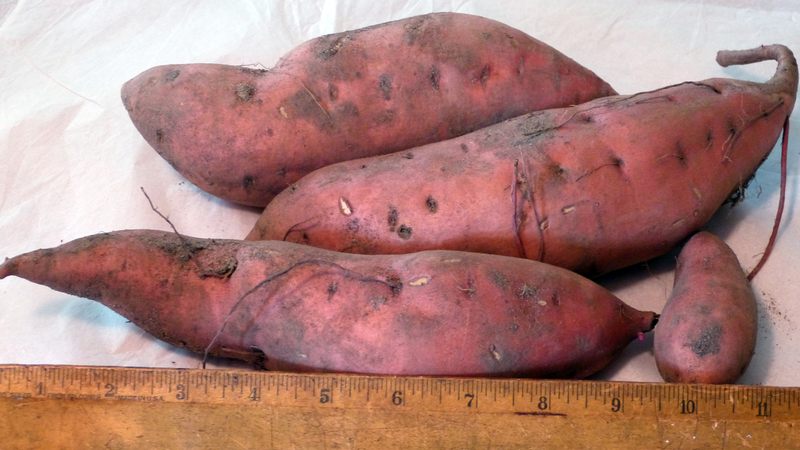 Sweet potatoes just out of the ground. The little one to the right would have had another 6 weeks or more to grow had I waited. Because I’ve been planting lettuce every week or 10 days since August, I have it in all stages of growth. 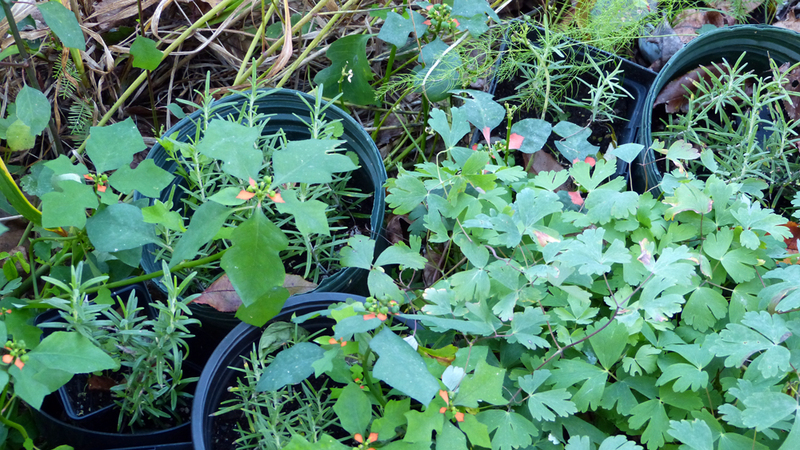 My last plantings of October 11 and 21st are still in containers. They’ll be moved to the garden soon, but I won’t anticipate a lot of growth from them UNTIL spring. 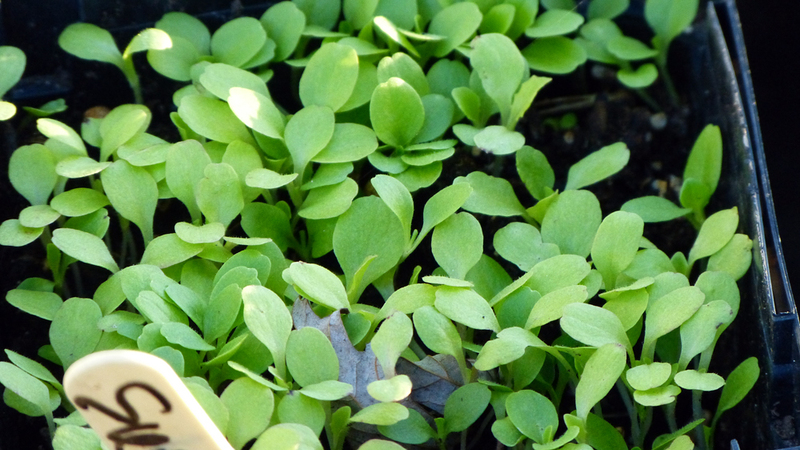 More than likely these October seedlings will be the ones to give me lettuce early next spring, long before my spring plantings are ready to be harvested. I notice more and more problems with germination in purchased seed no matter how reputable the source. Newly purchased Sierra Batavia, a favorite of mine, didn’t germinate this fall. Nor did Winter Density. Fortunately, I had newly saved seed from this year’s garden. I planted Winter Density and Sierra Batavia and they both germinated in 3 days. Sierra Batavia lettuce seedlings planted in a container in mid October. Germinated in 3 days. 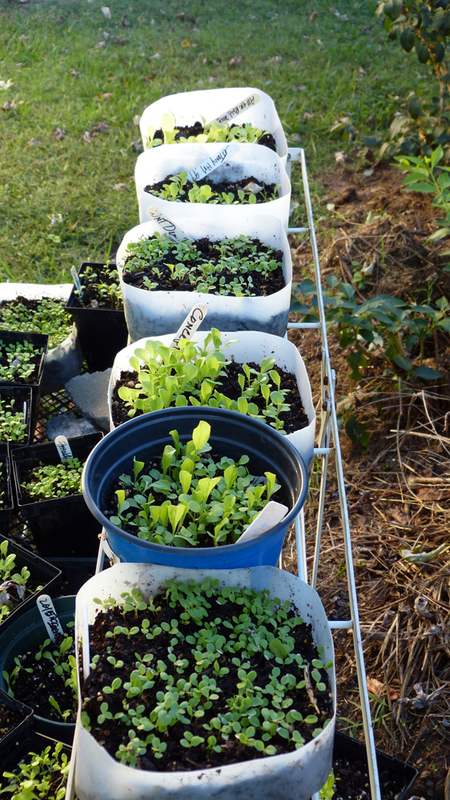 Five varieties of lettuce planted in August. I’ve been picking a large bowl full every day or every other day for a month. 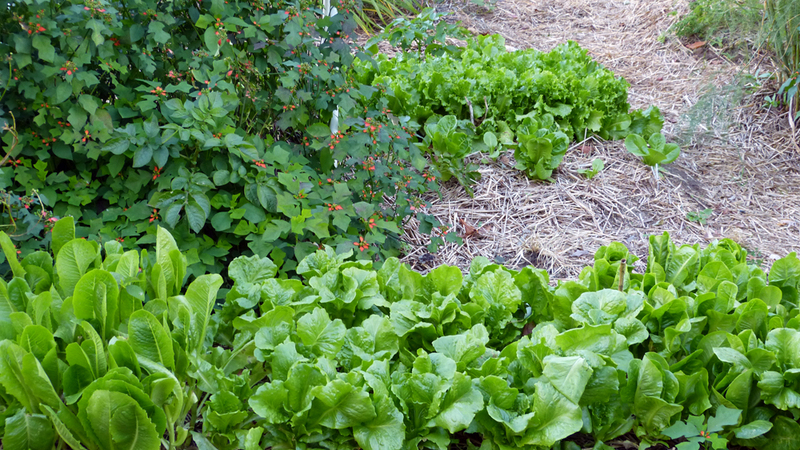 Below is a 9 foot just-planted bed of lettuce. Four varieties. Four rows about 5 inches apart. I estimate being able to eat out of this bed by Christmas and into January and February. 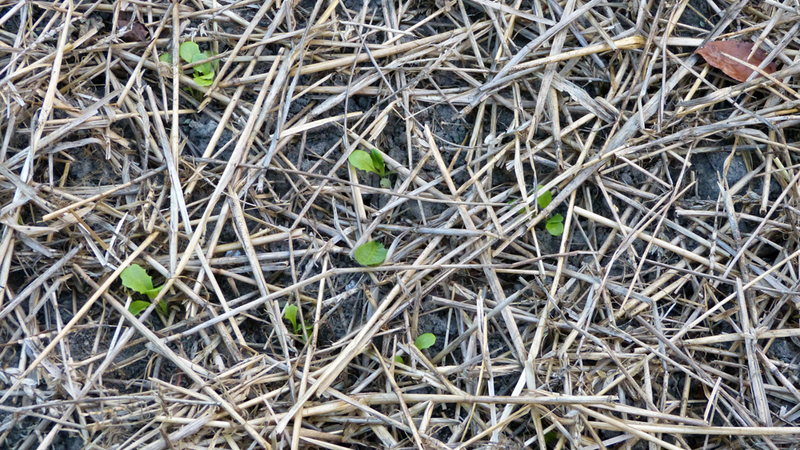 A just-transplanted bed of lettuce seedlings. You’ll note another ginger plant in the top right corner. A close up of newly transplanted lettuce seedlings. I never got around to transplanting these. I’ll try to winter them over in the garden with a bit of protection and transplant in the spring. Rooted rosemary cuttings sitting in pots at the garden entrance. Potatoes loved conditions this year and I had an abundance. Potato vines in this unharvested area never stopped looking good. Here it is the end of October and they’re still growing. 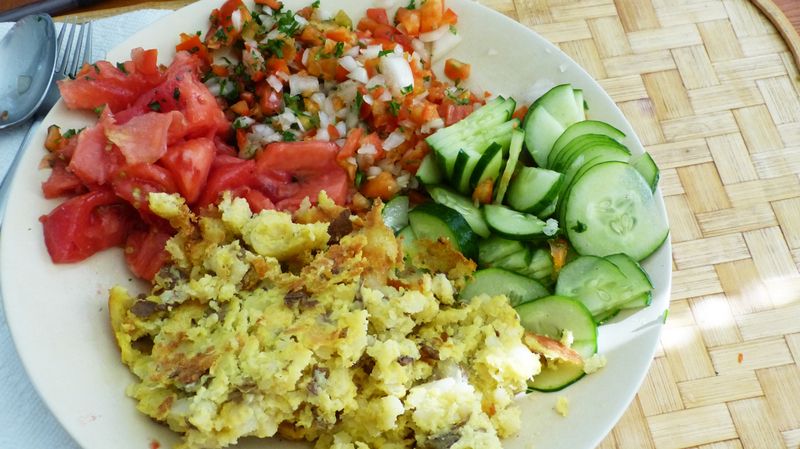 This September dinner from the garden includes an easy potato dish. Steam the potatoes till done. Mash. Add a beaten egg and a little water. Cook in oiled skillet until brown/crisp on bottom. Turn with a spatula to brown other side. As I approached my garden yesterday just before evening, I realized how misleading it can be to the unknowing eye. Many look and never know I have a garden. But I do. And it gives me the food I need to sustain me. There’s not much food (if any) you can buy at the stores that is health giving. Your very best bet is to grow your own. If you can’t do that, hopefully you know a farmer you can trust. After that, buying organic would be your best option. But be aware that more and more “organic” is not always what it should be. Be in control as much as you can. It’ll make a big difference. Walking to my daughter’s junior high this week, I noticed a pretty plant mixed in with weeds growing on the side of the road–summer poinsettias! I could identify them because I had seen them in your photos. I thought–Oh look! Theresa flowers! Your reddish wasp is a Northern Paper Wasp, and the black one is Sphex nudus. 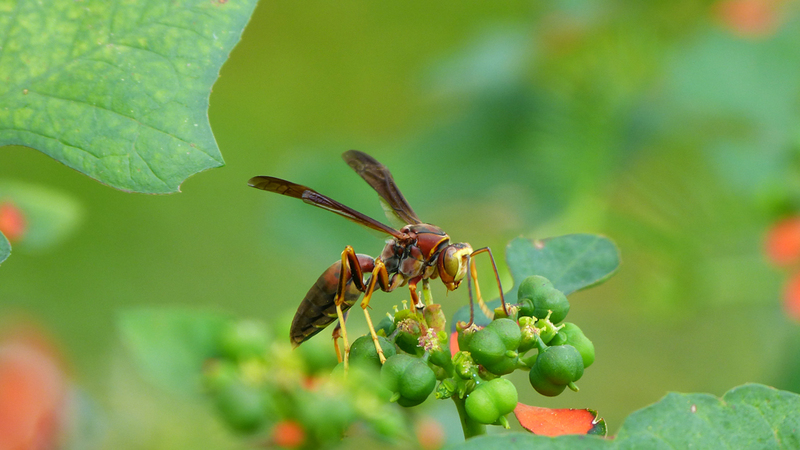 Paper wasps are social, of course, and provision their nests with caterpillars to feed their larval young. Sphex are solitary ground nesters (thus, less likely to sting), and provision their nests with grasshoppers and katydids. Both are nectar feeders and important pollinators as adults, so helpful to gardeners all round! What a delightful, beautiful, informative walk thru your garden with my morning coffee. Your meals look absolutely delicious! 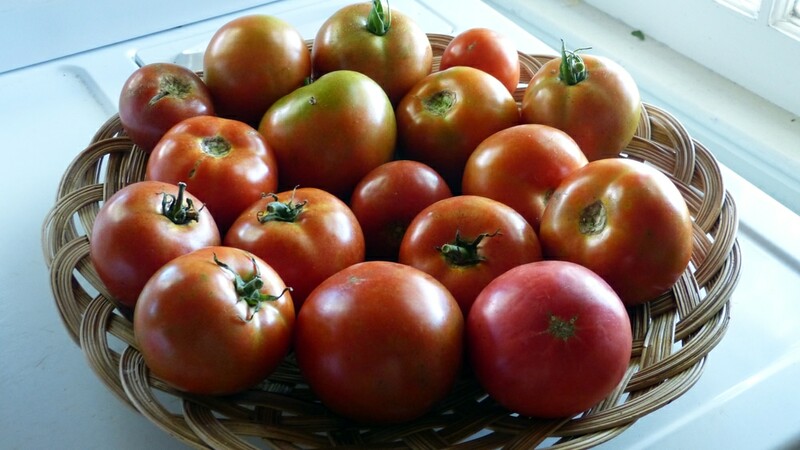 What are your favorite cultivars of tomatoes? Do you save tomato seed each year or purchase? I had no idea turmeric was so beautiful!. I love your garden tours, thanks for letting us go on a walk through your garden with you! Lovely to see the full plates from your garden. This is what we call “living the dream”. Please advise as to how to grow turmeric and where to obtain a root to start. Also ginger. Is it difficult to raise? How long after planting before it is useable. 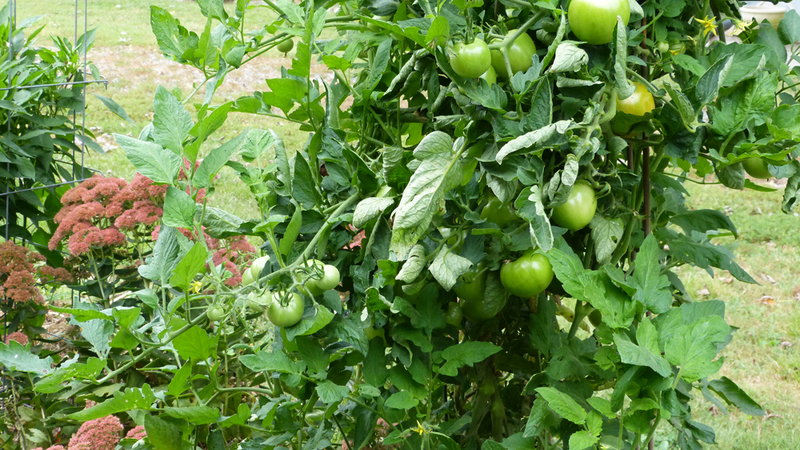 Also what is the name of the tomato still bearing fruit? My garden was miserable this year, I would also like to raise the aster you have as mne are the tall Tartarian and tend to flop. Oh, there is so much that I love about this post. Everything looks wonderful! I didn’t know that ginger and tumeric could be grown here. I love them both. And, oh my goodness, that pepper plant! What a blessing to have such abundance. Beautiful tour. Thank you! Theresa, Wonderful tour! Very informative. Thanks for all your efforts! Thanks for the information on the wasps, Julie. I did a bit of searching and it’s my understanding that there are 3 different varieties of paper wasps. I’ve seen at least two in my garden. I like to watch them get potato beetles and cabbage worms and carry them off. They’re real hunters and great to have in the garden. 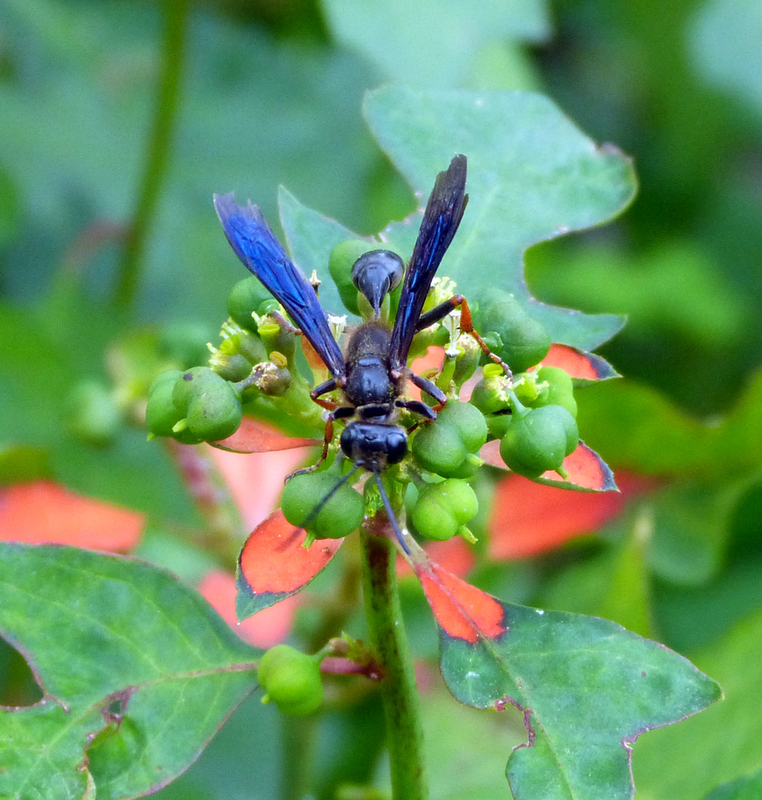 The other wasp is not black, but rather a brilliant metallic blue. Beppy called it a blue mud dauber which belongs to the Sphecidae family of wasps which (as I’m sure you already know) can vary in color. I’m so glad I’m now able to properly identify them. Margo, your question about slugs (sow bugs fall into the same category) is one I hear all the time. Which is why I’ve written so much about it. 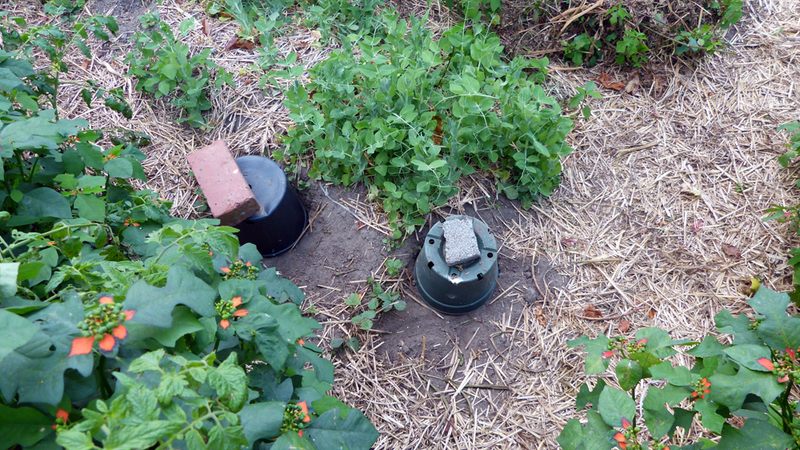 As far as having sow bugs – yes, every garden unless it’s been sprayed with chemicals is going to have sow bugs. They eat decaying organic material – mainly. Do I have “trouble” with sow bugs? My answer which will apply to slugs as well is: sometimes, but not often. And from time to time I’m not sure which of them is doing the damage. Also scroll down into the comments and read the question by Cate and my reply to her. 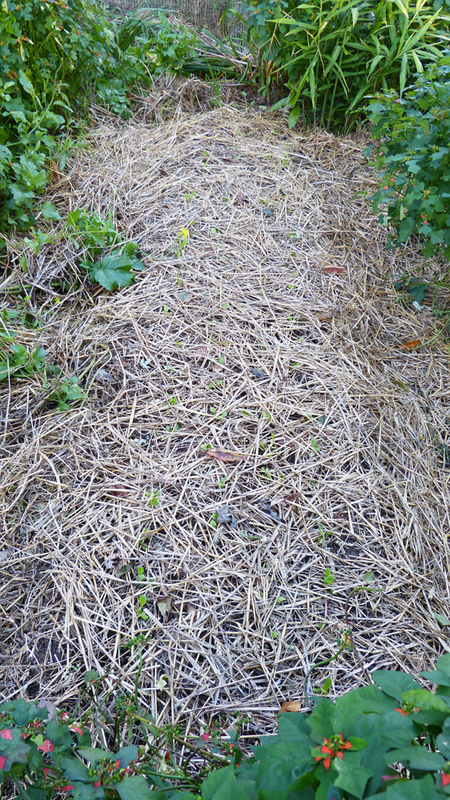 Also my post http://tendingmygarden.com/bugs-and-disease-are-they-hiding-in-the-mulch/ will cover more details for you. Toni, I usually save my seed and buy seed for new varieties I want to try. When Bill was sick I didn’t save seed and did not start again until this season. Cherokee purple, Mikado, and Mortgage Lifter are 3 favorite heirloom tomatoes. But the variety I depend on is Gary Ibsen’s open pollinated Big Beef. The Big Beef you see available from other sources is from a company that is now owned by Monsanto, so I will not use any Big Beef seed other than Gary Ibsen’s (Tomato Fest) or mine that I save. Other Big Beefs you see for sale are hybrids and don’t produce seed, that when saved, will always have the same characteristics as the parent. They all come from the source that Monsanto owns and I will not support Monsanto in any way knowingly. Pam, I’m so glad you enjoyed the tour. They take what seems like forever to put up, (this one took 20 hours or more) but I try to pack them with information. Bonny, your comment meant so much to me for so many reasons! I’m seriously considering doing a post on that if time allows. Thank you so much for sharing your thoughts. Mary, I’m going to do a post on turmeric and ginger because I think many will want to try their hand at growing them. They’re easy. I’ll answer with details in the post. 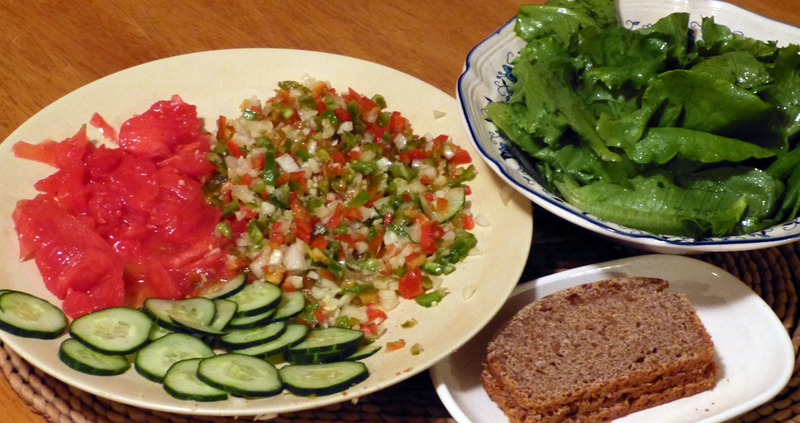 The tomato still bearing fruit is my favorite and most dependable — the open pollinated Big Beef of Gary Ibsen’s. (Tomato Fest) Above, in my reply to ToniI gave more details on that. Keep in mind that the variety is not the only reason it’s bearing fruit. I had the same variety in the garden and back meadow bed and they’re finished. It’s too long to go into but suffice it to say there are many variables involved. The open pollinated Big Beef is the one I depend on the most and a great tomato, but it will not necessarily guarantee a problem free year. Depends on what else is going on. Edie, I’m so glad you found the post informative and enjoyed it. I try to pack them with small bits of information that will help in the gardens of those who read. So your comment meant that I had accomplished that goal. THANK YOU! If you’re not subscribed to that, you might want to check in over the next few weeks and see if it’s up. I think you’ll enjoy it and find it informative. Theresa, thanks for the wonderful, inspirational, information-filled garden tour! I always enjoy everything you write. It seems that you always have something new to teach me in every one of your posts! Thanks for the time you spend providing this fantastic information for your readers! And I love being able to read TMG easily on my phone with your new mobile-friendly format! 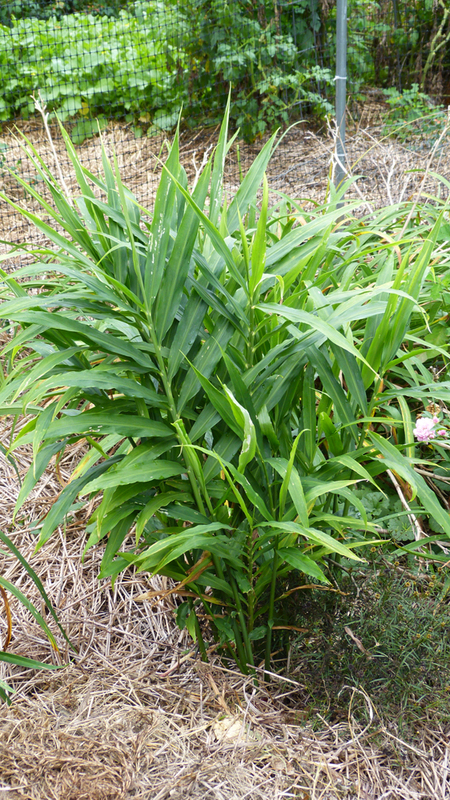 I also would be interested in a future post on growing turmeric & ginger. I know you live in a warmer climate, but always thought those plants were more of a semi-tropical species. Keep gardening…it really makes the heart smile in so many ways.